In April, we learned that the developers behind the 300-mile Mountain Valley Pipeline plan to extend the dangerous fracked-gas pipeline through Pittsylvania County, Va., and into Rockingham and Alamance counties in North Carolina, putting thousands more people in harm’s way. Dubbed “MVP Southgate,” the project would carve through 72 miles of private property, farms, fields and woodlands. At the end of June, Mountain Valley Pipeline LLC held a trio of open houses, as required by the Federal Energy Regulatory Commission Environmental Impact Statement pre-filing, for the residents of Pittsylvania, Rockingham, and Alamance counties to have a chance to speak to MVP representatives and get a deeper understanding of the Southgate project. On June 25, Alamance County kicked off the open houses for local community members who are living in the proposed route of the MVP Southgate extension. Pipeline / Company officials set up in Burlington, N.C., and provided large-scale maps of the proposed route and an overview of the entire project, and answered attendees’ questions about Southgate. Public officials including County Commissioner Chair Amy Galey were also in attendance to hear from MVP. Many landowners who attended came to show their resistance against the Southgate extension. 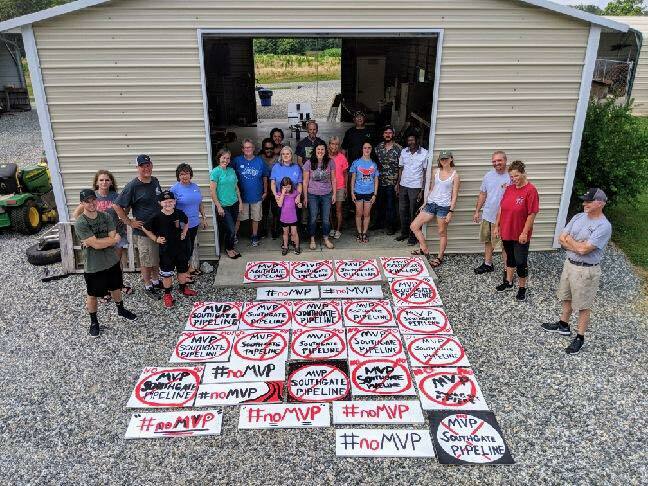 One couple wore t-shirts with the phrase “MVP Southgate Pipeline” surrounded by a large red circle with a slash through it, a nonverbal statement displaying their refusal of the pipeline. The couple told The Times-News that “they prefer to not have the extension built at all, but definitely want it nowhere near the Alamance community.” Landowning county members who are not currently in the proposed path also made an appearance and made sure MVP also knew their displeasure with the proposed project. Outside the event, Haw Riverkeeper Emily Sutton and Caroline Hansley from Sierra Club set up tables to advocate resistance of the pipeline, handing out “no pipeline” buttons and a list of unresolved questions the community members could ask MVP representatives. Unfortunately, attendees mentioned that MVP representatives did not provide enough information to the questions. According to MVP representatives, it is currently difficult to provide responses for landowners because the company is still in the pre-filing stage of the Southgate project — a slightly confusing excuse to community members especially during an open house that had been marketed as an informational session. Mountain Valley Pipeline LLC held the second open house in Rockingham County, N.C., on June 26. An industrial compressor is planned to be built along the proposed route in Rockingham. The session was nearly identical to the first: MVP representatives on standby to speak to attendees, Southgate information on all sides of the room, and a table for the Federal Energy Regulatory Commission tucked into the back nearly hidden from sight. Appalachian Voices and a representative from Sierra Club were present for residents to turn to as a resource. We provided flyers with information on county commissioners (none of whom made a public appearance to our knowledge), a factsheet on landowner rights in regards to surveyors, and anti-pipeline yard signs. 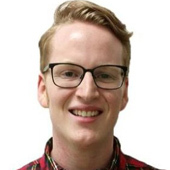 Ridge Graham, North Carolina field coordinator for Appalachian Voices, spoke about his opposition to the Southgate extension, citing public health risks and the lack of need for natural gas in the area. There were plenty in attendance and the majority undecided on the project, many of the attendees were there because they knew little to nothing about Southgate or its purpose in the county. Community members spoke with MVP representatives, who were handing out special MVP gift bags, and visited with Appalachian Voices and Sierra Club staff, noting they wanted to understand both sides of the Southgate extension. Many attendees appeared to be opposed after learning more details about the project. Chatham, Va. hosted the last open house on June 28 for residents of Pittsylvania County to see firsthand the current stage of the newly proposed MVP Southgate project. Attendees were able to walk through the open house and hear about the different processes involved in preparing for the Southgate extension to move out of its current pre-filing stage. The Southgate proposed plan includes a second industrial compressor station in Pittsylvania County, one noted as a very large, 3 turbine facility that would ramp up pressure to over 45,700 psi for the length of the proposed pipeline. MVP made it clear that feedback from landowners was important to them at this time. “It’s really helpful if landowners come forward. This is definitely the time, in the pre-filing phase.” Landowners in areas that may be affected by the Southgate extension can also contact MVP at any point during the project, online at mail@mvpsouthgate.com or by mail at: 625 Liberty Ave., Suite 1700, Pittsburgh, PA 15222. Lara Mack, the Virginia field coordinator for Appalachian Voices, and Sierra Club’s Caroline Hansley provided more thorough resources on the Southgate extension, including information on landowners rights and ways for county residents to learn about the MVP. Both women spoke out about how they are concerned for people’s health and were there to aid landowning community members in understanding their rights in the face of Mountain Valley Pipeline LLC and the surveyors the corporation employs. Visit the community No MVP Southgate website for more information about the project. To get involved, contact North Carolina Field Coordinator Ridge Graham at ridge [at] appvoices.org. June 21: A federal court temporarily halts construction in streams and wetlands along most of the route in W.Va.
July 3: Appalachian Voices and others take legal action to halt Atlantic Coast Pipeline construction activity in W.Va.
Born in Arizona and raised in Tennessee, Kevin’s love of the mountains drove him to move even further east to Boone, N.C., where he serves as The Appalachian Voice's Associate Editor and a communications associate for the organization.